Anyone want to be a part of a spectacular hike that’s going to light up the San Gabriels and (maybe) be seen from miles around? The folks from the Friends of Echo Mountain Facebook page are organizing a massive night-time group hike to commence on the early evening of December 20. Everyone meets up at the Cobb Estate at the intersection of Lake Avenue and Loma Alta in Pasadena between 5:00pm – 6:00pm. 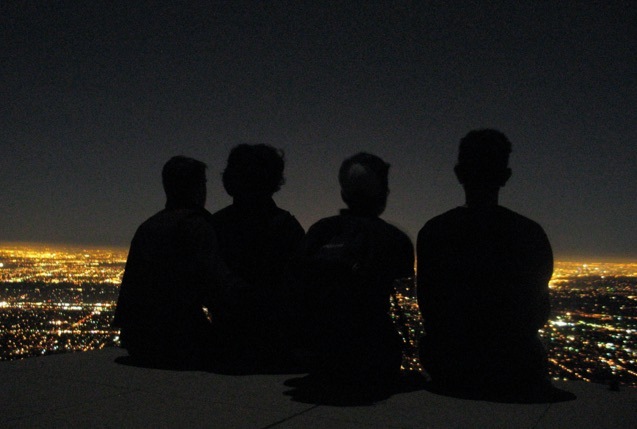 Hikers are encouraged to bring as many flashlights or LEDs as they can carry, and the group will make their way up to the top of Echo Mountain as a trail of light. Meanwhile, photographers will be set up at various viewpoints surrounding the mountain to take photographs and a time-lapse of the lights. If enough people show and the weather is decent, the group of lights could be seen by many parts of L.A. County. Organizers are aiming to have 1000+ participants attend the event, and if they pull it off, it should be pretty rad! Sound like something you want to take part in? There is now an official Facebook event page for the hike, so be sure to RSVP (and share with friends) if you plan on attending. This is a public event and anyone who wants to go along is free to join. 2. There are no restroom facilities at the bottom or top of the trail. Go potty before you leave home. 3. There are points along the trail where a fall could cause serious injury. Keep a close eye on young children, and watch your step. 4. Evenings can get quite cool, especially once you stop hiking. Bring a change of shirt, and a warm jacket for the trip down. 5. If you are toasty warm at the beginning of the hike, you will be hot and sweaty once the climbing starts. Carry your warm clothes in a pack. 6. There are no trash receptacles along the trail. Plan on packing out what you bring. If we hope to do this every year, we need to keep the trail clean! 7. Don’t shine your light in other hikers’ eyes. Consider carrying headlamps in your hand while on the trail, as they will often blind whoever you look at. 8. Wear comfortable walking shoes. The hike is about six miles (if you complete the trip to the top), with 1450 feet of elevation gain. 9. If you’re unsure of your own ability, consider hiking Echo days before the event to see how you do. 10. Give your fellow hikers plenty of room, and practice proper trail etiquette. Those heading up have the right of way. Greet slower hikers as you pass them, so they know you’re there. The Friends of Echo Mountain a volunteer group of the Angeles Nation Forest that help maintain and preserve the Echo Mountain Historical Site. For questions or clarifications about the event, I’d advise commenting on the Friends of Echo Mountain Facebook event page.